Before we fire up the CNC machine for real, we want to make sure we have a good system in place for chip collection to keep the shop clean and safe. We have researched different types of collectors: single-stage; two-stage; and two-stage cyclones. Another—and some say more important—part of keeping the work area clean is proper air filtration. The goal of filtering the air is to rid it of any micro dust particles. Dust particles are problematic as they can get trapped in the lungs and create respiratory issues. The most effective mean of dust management is to capture the dust at the chip collection stage. However, a good complement to a central dust-collection system is a filtered face-shield. Suitable for use when machining MDF. Combination face-seal and hood for better protection. Balance and comfortable to wear. Removable 8 hour N-MH battery. 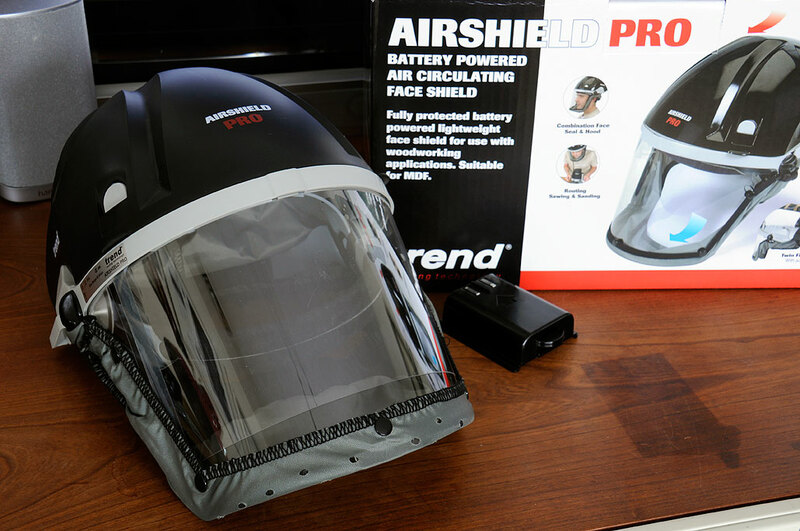 The AirShield Pro is a full-face mask with an in-helmet filtration/air-circulation system. Air is drawn into the slits at the top of the helmet at a rate of 5.6 cf/min and filtered by a pair of THP2 fine-particle filters. The user’s head is protected from incidental side exposure by the elastic skirt. There are two approaches an engineer can take when designing a full-face respirator. The filtration system can be an external pack connected to the helmet via an air hose. This design has the advantage of a lighter helmet, but is more cumbersome. The other option is to incorporate the filter into the headgear itself. The designer of the Trend AirShield took this latter approach. It has the advantage of a more compact unit. The motor required to move the air can be smaller and there is no hose to get in the way. In order for the helmet to be comfortable to wear, the weight of all the components must be properly distributed. By locating the battery pack in the rear, the 2.2lb helmet is nicely balanced when worn. We expect the Trend AirShield PRO to be a great addtion to our wood shop, and it will be especially appreciated once the CNC machine is up and running. 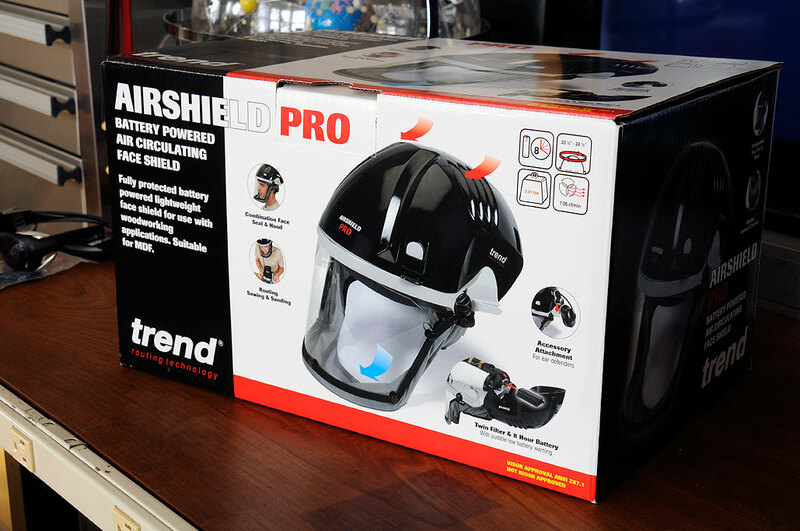 We will have a FirstUse look at the Trend AirShield PRO early next year. Look for it in the Spring of 2013.